Miami Beach, Florida: A 35-year-old construction worker fell approximately 12ft. at a Miami Beach construction site this past Monday and died shortly after being assisted at Jackson Memorial Hospital, according to the local authorities that arrived to the accident scene. Miami Beach Fire Rescue units reported that the construction worker, an outsourced mason working for the Rinaldi Group, fell from the third floor onto the second floor of a building that was being constructed at 2000 Washington Ave. 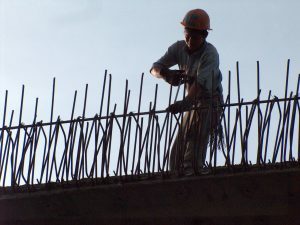 The construction work accident that led to the worker’s tragic fall is being investigated by officials from the Occupational Safety and Health Administration, which according to sources, requires that rebar caps be placed on the ends of any protruding rebar in the event a worker falls onto them while on the job. In this case, officials will have to determine if the construction firm acted negligently by leaving the rebar unprotected. If that is determined to be the case, the construction company may face severe fines to compensate for any wrongful death claims brought on by the victim’s family. Though it is hard to put a price on life, legitimate negligence on behalf of an employer and his/her insurance provider must. Miami and North Miami Beach Law Firm Serving Accident Victims Suffering Personal Injury on Stairs, Steps, and Ramps in Miami. According to a recent study, over 1 million Americans suffer personal injuries from accidents involving stairs, steps, ramps. This is a whopping figure when you consider that most of these accidents include individuals of all ages, despite the elderly and toddlers among the most at risk. Stairs, steps, and ramps are practically everywhere in Miami; in hotels, restaurants, shopping malls, supermarkets, apartment buildings, practically anywhere people need to go and down. 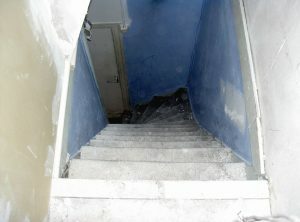 According to Florida Premises Liability laws, property owners and those responsible for private or public establishments, are legally liable for any accidents resulting in personal injury brought on by improper maintenance, operating conditions, or unsafe standards which may cause an individual to slip, trip, or fall on said premises. Stairs, steps, and ramps must be kept free of any obstacle, liquid, object, substance, etc., that may lead to someone falling and hurting themselves. The property owner or responsible party may be legally liable to cover any, if not all, medical costs, lost wages, etc., as a result of their negligence to provide safe stairs, steps, or ramps on their premises. It is the responsibility of architects, engineers, contractors, and masons to make sure stairs, steps, and ramps are properly built in terms of uniformity, elevation and inclination. Steps or staircases that are uneven or ramps that are too steep, can represent risk of injury to the elderly and to those suffering from physical or mental challenges. Vertigo, for example, can cause an elderly person to lose their balance and go tumbling down a flight of stairs, with the results being multiple fractures or even wrongful death. Slip and fall accidents can be just as common as car accidents. A slip and fall injury can occur anywhere from your favorite restaurant on your family’s night out to your local supermarket picking up groceries for your family. Injuries from slip and fall accidents can vary from sprains that may require time off from work to serious fractures and broken bones that may lead to long-term disability.